Trippy. Mesmerizing. Magical. Vibrant. Kaleidoscopic. What am I describing? Is it the words of someone's first experience with a spirograph? Is it a description of my polish storage? No, I'm actually giving you the short version of what I see Cirque du Soleil performances being. It could also be describing Ben and Pete's experience at a show. Coincidently it also describes the new China Glaze collection based on the upcoming film experience, Cirque du Soleil: Worlds Away. This new collection is available now, and has some really vibrant colors as well as some modern glitter mixes. Think Marshmallow sandwiches with glitter, and black and white matte glitter. That's right...a large polish company has ventured into matte glitter territory, and believe me, it's amazing. But more on the black and white glitter later. First, I want to show you some of the sandwiched glitter, It's a Trap-eze! This one's a thin white base with buried treasure of multi-colored glitter. When you bury the glitter beneath white like China Glaze has, you get what appear to be matte glitter, but are actually your normal shiny pieces, matted by the white. The result is stunningly bright. It seemed only fitting to pair this unusual and awesome glitter with colors also from the collection, including Creative Fantasy, Surreal Appeal, Escaping Reality, Def Defying, and Hanging in the Balance. I drew inspiration from the aerial dancing the promotional images and videos gave us a glimpse at. This form of movement is done entirely on long strips of silky ribbon suspended in the air. Dancers twist and move around the ribbon, creating a spectacle totally appropriate for a Cirque du Soleil show, or in this case, movie. You can read more about the new China Glaze Cirque du Soleil Worlds Away collection's release and inspiration here, and catch swatches on some of your favorite blogs right now, including Let them have Polish. As for me, you'll be seeing several more nail art posts using this collection. Who wouldn't be inspired?! Oooh this is so gorgeous, I've been dying to see it but I think I'm going to wait and see in downtown disney when I go! Lovely nails so vibrant and eye catching! This is exquisite! Tres tres cirque et chic! 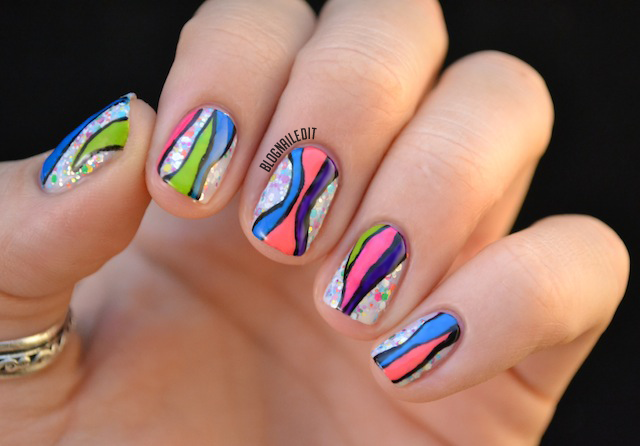 This mani is so cool! i'm pinning it to my admired nail art! This is sooo pretty! I love it! This is fantastic!! I am just loving the bright, saturated colors in this collection. Please don't leave "Could you follow me, please?" comments on my blog. Really love your nail art design. The colours look really good together.